Don't miss any more business in those down times. Contact Hyundai Forklift of Southern California for all your forklift rentals. For a week, month or longer, our forklift rentals are reasonably priced to help keep your company moving forward. We specialize in LPG forklift rentals and electric forklift rentals. And most importantly, you can count on quick delivery via our flatbed truck. 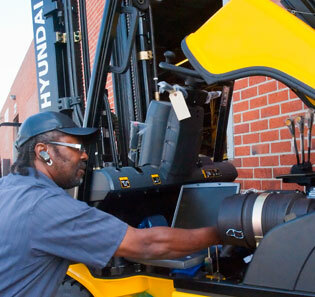 Your needs come first at Hyundai Forklift of Southern California. So the next time you're in the market for affordable, top-quality lift trucks - new, used or reconditioned - go with Hyundai Forklift of Southern California. Our highly experienced team of professionals have made us the leader in material handling solutions. Offering a wide variety of lift trucks, we can give you options that are safe, efficient, cost-effective, and ergonomically sound. Make us your first stop when selecting lift trucks, such as electric forklifts, pneumatic tire forklifts, cushion tire forklifts or even narrow aisle reach forklifts.